Production of the Automated Transfer Vehicles is gearing up. After the flawless flight of the first ATV, Jules Verne, the second, Johannes Kepler, is being completed for launch later this year. Now the third ATV has been named after the Italian physicist and space pioneer Edoardo Amaldi. Europe's ATV space freighter proved its maturity in 2008, when Jules Verne completed a demonstration flight to the International Space Station (ISS), docked with 4.5 tonnes of food, water, fuel, supplies and equipment, served as a propulsion module for six months and finally undocked and entered Earth's atmosphere over the southern Pacific. The ATV spacecraft are key to the Station's logistics and operations. They are an excellent demonstration of Europe's capability in creating space infrastructure for human spaceflight and exploration. The first ATV was named after the visionary French science-fiction writer Jules Verne, and the second honoured German mathematician and astronomer Johannes Kepler. "Italy is a key European country in our participation in the ISS partnership. By naming ATV-3 after Edoardo Amaldi, we celebrate a great Italian, but also a committed European who understood the importance of pooling resources and minds together to achieve important results," said Simonetta Di Pippo, ESA Director for Human Spaceflight on the occasion of a press conference held in the presence of Sottosegretario Guiseppe Pizza, Ministry of Education, University and Research and Enrico Saggese, President of Italy's ASI space agency at the Italian Ministry in Rome. "We are paying tribute to a visionary mind, to a great scientist but also to an idea of cooperation that is embodied in the ISS partnership. The ATV is the first recurring production of an exploration spacecraft and places Europe a step closer to our partners. "I am glad that Italy is taking so much pride in their participation in the ISS, which is a recognition of their human and industrial capabilities." "Amaldi was one of the few that in the post-war years prompted into action starting a process leading to the founding of ESRO, and in following of ESA. It is widely acknowledged that since the 1950s the inception of the visionary concept aiming to a unified European capability to explore outer space is largely due to a bunch of prominent European scientists, and Edoardo Amaldi was a leading name among them." Edoardo Amaldi was a leading figure in Italian science in the 20th century, particularly in fundamental experimental physics. In Rome, in the 1930s, Amaldi was a member of a group of young scientists who, led by Enrico Fermi, made the famous discovery of slow neutrons which later made possible the nuclear reactor. He contributed to nuclear physics in the 1930s and 1940s and to cosmic rays and particle physics afterwards. He became a pioneer in the search for gravitational waves in the 1970s. Approximately every 17 months, ATV carries 6.6 tonnes of cargo to the ISS 400 km above Earth. Its new technologies can be adapted in the future for developing new spacecraft, such as the Advanced Reentry Vehicle. The pressurised part of the ATV would be replaced by a reentry capsule able to return cargo and valuable experiments to Earth. ATV capabilities could also be used later to develop spacecraft for astronauts transportation, complex space infrastructures or robotic sample-return missions. Fuel, water, oxygen, air and most of the dry cargo have been loaded into ESA's third Automated Transfer Vehicle, Edoardo Amaldi, as the 9 March liftoff approaches. Since arrival at Europe's Spaceport in Kourou, French Guiana, last August, the space ferry has been undergoing intensive preparations to fly to the International Space Station next month. Above: Technicians in Europe's spaceport in Kourou have the delicate task of loading dry cargo into ATV-3 for its journey to the International Space Station in March 2012. The vessel's mission is set to start with liftoff at 10:00 GMT (11:00 CET) on 9 March on a powerful Ariane 5 ES launcher. It will dock automatically with the Station at 01:38 GMT (02:38 CET) on 19 March, remaining attached until the end of August. Launch preparations began as soon as the 10-tonne ferry's two main sections — the cargo carrier and the spacecraft itself — arrived in French Guiana by ship late in August. "By end-August, we had moved both halves into their respective cleanrooms here and started checking that everything was OK after the sea journey," says ESA's Charlotte Beskow, ATV deputy launch campaign manager. "September and October were spent checking systems, preparing the loading of dry cargo arriving from Europe and NASA, and integrating final components such as the folding solar panels that had been shipped disassembled. "By mid-December the two sections of ATV-3 had been joined, and Edoardo Amaldi finally looked like a real spacecraft." Above: ATV Edoardo Amaldi being moved to a different building at the Guiana Space Centre. January saw a series of delicate fuelling operations, says Charlotte: "By the end of last week, we had loaded 5411 kg of fuel, to be used to power itself and to perform reboost and attitude control of the Station, plus 860 kg of fuel to be transferred to the Russian Station segment. We've also taken on air and oxygen." Part of February will be spent loading 535 kg of last-minute items, which must be carefully lowered into the ATV's cargo compartment via the main docking hatch. In parallel, the operations team at the ATV Control Centre in Toulouse, France, have been running exhaustive simulations to ensure that controllers and engineers are ready for all phases of the flight as well as any emergencies. "We practise for any conceivable situation. For example, what to do if docking goes wrong or if we suddenly lost our main flight computers," says Jean-Michel Bois, Head of the ESA Operations Management Team in Toulouse. "The entire ground team and our mission control systems passed the Joint Operational Readiness Review with NASA and Russia's Roscosmos/RSC Energia on 17 January, and, here in Toulouse, we completed a tough, three-day simulation on 27 January. As of today, we are ready to go to the Space Station." Last week, ATV-3 also passed the critical Flight Acceptance and Operations Readiness reviews, but a number of crucial launch preparations must still be completed. "On 7 February, ATV Edoardo Amaldi will be moved to the huge Vertical Integration Building for mounting on the top of its Ariane launcher two days later," says ESA's Massimo Cislaghi, ATV-3 mission manager. "There are also additional simulations planned, including one involving the Station control centres in Houston and Moscow. "By early March, we will be ready for a spectacular morning liftoff and a smooth flight to the Station." A routine inspection has concluded that additional measures are required to ensure the maximum readiness of the third Automated Transfer Vehicle (ATV) for launch. It has therefore been decided to postpone the launch previously scheduled for March 9. The launch of ESA's third Automated Transfer Vehicle is part of the internationally coordinated servicing effort to support the International Space Station. According to ESA, two cargo bags were not properly strapped down, raising the concern that during liftoff they could move or fall. To avoid this, the ATV will be moved back to the integration room so the straps can be tightened, which will take a few days of work. The launch of ESA's third Automated Transfer Vehicle (ATV-3) is targeted for March 23, with a liftoff scheduled for 4:31 UT (5:31 CET / 12:31 a.m. EDT). ESA's third Automated Transfer Vehicle, Edoardo Amaldi, is ready for launch to the International Space Station. ESA's formal Launch Readiness Review on Monday revealed no problems with the vessel. Launch is set for this Friday (March 23) at 04:34 GMT (05:34 CET / 11:34 p.m. CDT Thursday, March 22). 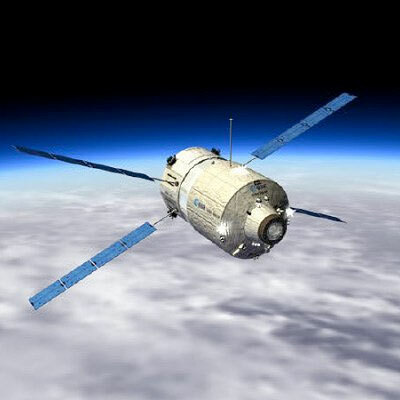 The Automated Transfer Vehicle (ATV) is the largest cargo vessel supplying the International Space Station with food, water supplies and propellants. On March 20, Arianespace conducted their readiness review for the Ariane 5 mission, VA205, that will deliver ATV to orbit. It, too, is cleared for flight. 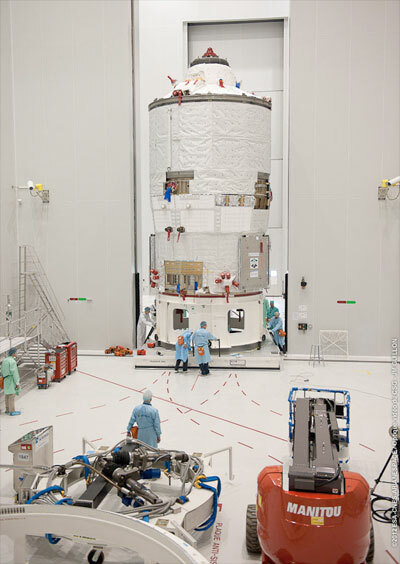 Today, Ariane and ATV Edoardo Amaldi will be rolled to the launch pad in Kourou, French Guiana. The total vehicle mass is 777 tonnes — the heaviest ever for an Ariane. This ATV is also the rocket's heaviest payload so far. The European Space Agency's (ESA) ATV Edoardo Amaldi lifted off from Europe's Spaceport in Kourou, French Guiana, Friday (March 23) at 04:34 GMT (05:34 CET, 01:34 local, 11:34 p.m. CDT March 22) on an Ariane 5 launcher, operated by Arianespace, heading toward the International Space Station. The Automated Transfer Vehicle, the most complex spacecraft ever produced in Europe, is now en route to deliver essential supplies to the orbital outpost. It will also reboost the space station's orbit while it is attached for about five months. ATV Edoardo Amaldi is the third in a series of five supply ships developed in Europe to fulfill its obligation toward the exploitation costs of the station. This vessel is the first to have been processed and launched within the target rate of one per year. "Europe providing an annual service to the station becomes a reality due to the dedication, competence and interaction of our space industry, national agencies and ESA," said Jean-Jacques Dordain, ESA's Director General. "ATV-3 demonstrates Europe's capacity to deliver regular high-profile missions to support demanding crewed spaceflight operations, in coordination with our international partners." ATV features high-precision navigation systems, highly redundant flight software and a fully autonomous self-monitoring and collision-avoidance system with its own independent power supplies, control and thrusters. "We are proud that ESA is providing the most sophisticated vehicle servicing the space station," said Thomas Reiter, ESA's Director of Human Spaceflight and Operations. "Based on the capabilities and knowhow that ESA and European industry developed in the context of the ATV programme, we have now the opportunity to further evolve this technology. This will open up a wide range of opportunities for us to contribute to future ventures in space exploration." The launcher with its 20-ton payload started its flight over the Atlantic towards the Azores and Europe. An initial eight-minute burn of Ariane's upper stage took ATV-3 into a low orbit inclined at 51.6 degrees to the equator. After a 42-minute coast, the upper stage reignited to circularise the orbit at an altitude of 162 miles (260 km). About 64 minutes into flight, the supply ship separated from the upper stage. Twenty-five minutes later, ATV-3 started deploying its four solar wings, which was completed a few minutes later, marking the end of the launch phase. Edoardo Amaldi is now making a series of maneuvers to rendezvous with the space station on March 28 at the projected time of 22:34 GMT (5:34 p.m. CDT) where it will dock under its own control with Russia's Zvezda module. During the mission, the ferry is being monitored by the ATV Control Center (ATV-CC), in collaboration with space station control centers in Moscow and Houston. ATV-CC is located in Toulouse, France, on the premises of the French space agency, CNES. Two early space leaders whose work helped lead to the International Space Station (ISS) were remembered on Friday (March 23) with the launch of their writings on board an unmanned supply craft bound for the orbiting laboratory. German rocket pioneer Wernher von Braun, who was born 100 years ago to the day, and Edoardo Amaldi, an Italian physicist who was also memorialized with his name on the spacecraft, were each represented on board by copies of vintage dispatches that illustrated their respective visions for space exploration. ESA's ATV Edoardo Amaldi has docked with the International Space Station's Russian Zvezda module. The docking occurred smoothly when the ATV's docking probe was captured by Zvezda's docking cone at 00:31 CEST (22:31 GMT, 5:31 p.m. CDT) on March 28. The docking probe was retracted, followed by the hooks between the two craft closing. The data and electrical connections then were established. The 20-ton vessel, flying autonomously while being continuously monitored from the ground, docked with the 450-ton orbital complex with a precision of 6 centimeters as they circled Earth at more than 28,000 kilometers per hour. "No one should consider that this smooth and gentle docking between these two giant spacecraft is either an easy or routine task," said Thomas Reiter, ESA's director of human spaceflight and operations. "The technologies we have demonstrated in operational conditions with the ATVs have a tremendous potential for future human spaceflight and exploration missions." The docking concluded a step by step approach to the orbital outpost by the large freighter. The vehicle maneuvered autonomously during these critical operations, monitored by a separate on board control system to ensure the safety of the station and its crew. The ground teams at the ATV Control Center in Toulouse as well as ESA astronaut Andre Kuipers and his crewmates on the station were also watching the approach, in case a hold or an abort had to be ordered. Like its predecessors, ATV-3 has a multifaceted mission. As a space tug, it is loaded with 3,150 kg. of propellant to reboost the station's orbit to compensate for the natural decay in altitude caused by atmospheric drag or to move it from the path of potentially hazardous space debris. ATV also provides attitude control when other spacecraft are approaching the station. As a space tanker, it is delivering 860 kg. of propellant, 100 kg. of oxygen and air, and 280 kg. of drinking water, all to be pumped into the station's tanks. As a space freighter, it carries 2,200 kg. of dry cargo such as scientific equipment, spare parts, food and clothes for the astronauts. During the five months it will spend docked to the station, it will act as a temporary space module, providing 45 cubic meters of extra crew quarters on the orbital outpost. On previous missions, ATV was welcomed by the astronauts as "the quietest place in the station" and was often the preferred area for working. 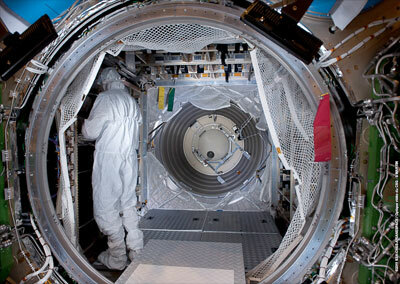 At the end of its mission, scheduled for Aug. 27, ATV-3 will separate from the station, packed with waste bags. The following day, it will be directed to burn up safely in the atmosphere during reentry over the South Pacific Ocean. Expedition 30 flight engineer Andre Kuipers entered the "Edoardo Amaldi" Automated Transfer Vehicle-3 (ATV-3) on Friday (March 30), kicking off several planned weeks of cargo unloading. ATV-3 is slated to remain docked to the station until early September, however a power issue threatens to curtail the spacecraft's stay. Late Thursday, Russian atmosphere scrubbers were activated to ensure the removal of any contamination that may have occurred on the ground when the ATV's pressurized cargo compartment was opened for pre-launch packing adjustments. When the scrubbers were activated, ATV flight controllers in Toulouse, France, reported the failure of one of two redundant Russian Equipment Control System channels that provide station power to ATV-3. The backup power channel passed an initial test on Friday, but it has not yet been connected to station power systems. If a Saturday morning test is successful, the backup power channel will be used for a planned reboost Saturday afternoon using the ATV's thrusters. If the backup channel does not function properly, the reboost will be cancelled. European Space Agency (ESA) flight controllers told Mission Control Houston, that if power systems cannot be restored to normal configuration, the newly arrived cargo craft's solar arrays won't be able to generate enough electricity because of sun angles. While it is highly unlikely, the situation could lead to an earlier than planned undocking of ATV-3. NASA, ESA and Russian space agency flight controllers are working together on contingency plans to try to extend power to the ATV. The multinational team is drafting a plan for the unloading of critical cargo if a worst-case scenario should lead to an expedited undocking. Multi-national flight controllers successfully connected a backup power channel on Saturday (March 31) to the European Space Agency's (ESA) "Edoardo Amaldi" Automated Transfer Vehicle (ATV) cargo ship, enabling electricity to flow from the International Space Station to the ATV. The operation set the stage for a reboost of the station on Saturday afternoon while avoiding an early undocking of the resupply craft. The troubleshooting involved commanding from ESA's ATV Control Center in Toulouse, France to connect a backup power channel in the Russian Equipment Control System, or RECS, that is designed to route power to the ATV from the station, much like the SSPTS, or Station-to-Shuttle Power Transfer System, did for the shuttle when it was docked to the for station assembly missions. The primary channel of the RECS failed late Thursday (March 29) during air scrubbing of the interior of the ATV. The cause of that failure is under investigation. Working together, flight controllers at Mission Control Houston, Toulouse and the Russian Mission Control Center outside Moscow reported that the backup RECS channel was connected to the proper power bus with all relays closed at 12:03 p.m., enabling electricity to reach the ATV. The ATV can either receive power-producing electricity through the RECS or through its solar arrays. But the station will enter a timeframe on Monday in which the angle of the sun relative to the station would have made it impossible for proper power generation for the spacecraft's systems through its arrays alone. Had today's connection operation been unsuccessful, flight controllers would have begun work for an undocking of the ATV early next week. To prepare for that possibility, ISS Expedition 30 commander Dan Burbank and his five crewmates gave up their off-duty time on Saturday and began to unload critical cargo from the ATV at 5 a.m. CDT. Working efficiently off of a priority list, the crew moved bags of vital supplies of clothing, food, spare parts and other crew provisions from the European ship to the station and began loading trash back into the cargo vehicle. After word was received that the power connection had been made and that the path had been cleared for the reboost, flight director Ginger Kerrick directed the crew to forego any further transfer of cargo for the day and for flight controllers to stand down from any additional work to protect for an undocking of the ATV next week. The station reboost, which was scheduled to begin at 4:54 p.m. CDT, would only have been possible had the power connection been made from the RECS to the ATV. The reboost, which involves a four minute, 51 second firing of the ATV's primary thrusters, is designed to raise the perigee of the station's orbit by about two statute miles, setting up the proper phasing for the a Progress docking on April 22, the undocking and landing of Expedition 30 commander Dan Burbank and flight engineers Anton Shkaplerov and Anatoly Ivanishin on April 27, and the launch of their replacements, Expedition 31/32 crew members Gennady Padalka, Joe Acaba and Sergei Revin, on May 15. The undocking of the European Space Agency's third Automated Transfer Vehicle (ATV-3) from the aft port of the International Space Station's (ISS) Zvezda service module, originally planned for Tuesday (Sept. 25) at 5:36 p.m. CDT (2236 GMT), was called off due to an issue with a display and command panel inside Zvezda. Expedition 33 flight engineers Yuri Malenchenko and Aki Hoshide, who together closed the hatches to ATV-3 on Monday, were preparing to monitor its departure when the issue arose at about 5:30 p.m.
A new date for the undocking of the spacecraft will be determined after a review of data to identify the cause of the problem. After a three-day delay, the European Space Agency's "Edoardo Amaldi" Automated Transfer Vehicle 3 (ATV-3) undocked from the aft port of the International Space Station's Zvezda service module on Friday (Sept. 28) at 4:44 p.m. CDT (2144 GMT). Tuesday's initial attempt at undocking the European cargo ship was called off due to a communications error between Zvezda's proximity communications equipment and computers on the ATV. Russian flight controllers resolved the problem, and station program management approved a second undocking attempt. Expedition 33 flight engineers Yuri Malenchenko and Aki Hoshide, who together closed up the hatches to ATV-3 Monday, monitored its automated departure from a control panel inside Zvezda. Meanwhile, Commander Suni Williams photographed the departing freighter to document the condition of its docking assembly. ATV-3, now filled with trash and unneeded items, backed away to a safe distance from the orbiting complex after undocking. Once it reaches a distance of about 4,500 miles in front of the station, the European cargo craft will fire its engines twice on Tuesday (Oct. 2), to send it into the Earth's atmosphere for a planned destructive re-entry that evening. As ATV-3 plunges back into the atmosphere, the Re-Entry Breakup Recorder that Hoshide installed in the vehicle will collect and transmit engineering data to enhance the efficiency of spacecraft designs and minimize the hazards to people and property on the ground even in the case of an uncontrolled re-entry for future cargo ships. "Edoardo Amaldi," named for an Italian physicist regarded as one of the fathers of European spaceflight, delivered 7.2 tons of food, fuel and supplies to the orbiting complex after docking on March 28. The fourth ATV, named "Albert Einstein," is slated to launch in April 2013. More than 32 feet long (9.75 meters) — about the size of a traditional London double-decker bus — the ATV is the largest and heaviest vehicle that provides cargo resupply for the station. See here for discussion of the ATV-3 "Edoardo Amaldi" mission.